I have always had a ‘make do and mend’ attitude, being one of 7 children, I was quite used to jumpers being unpicked and re knitted, altered dresses and trousers, sheets being turned middle to edge, etc. This was the start of my waste not, want not, ethos. My days are spent designing and sewing, or unpicking tatty old quilts, which are only fit for the dogs bed – by unpicking these beautiful old quilts, I am often able to save tiny pieces of fragile fabrics, occasionally, I have been fortunate enough to discover another layer of fabric under the top one – where a thrifty housewife has covered the worn quilt with fabrics of her own. 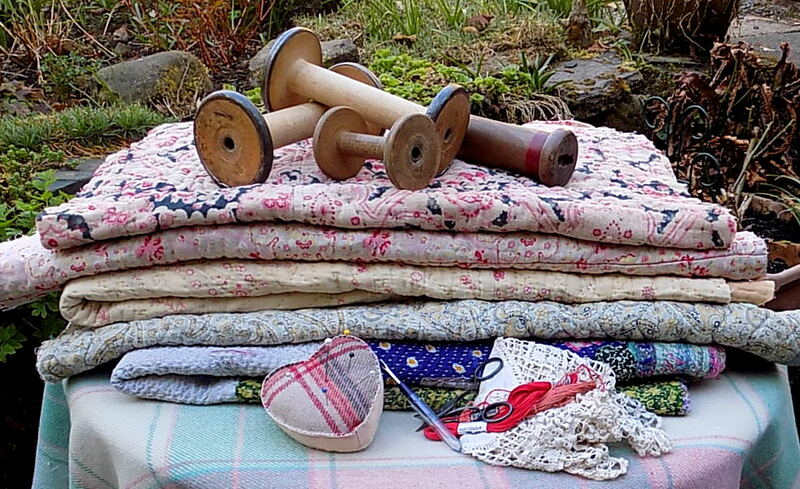 Filled with history, I always think about the overworked lady of the house stitching whenever she had a moment to prolong the life of the quilt. I use pieces of fabric to make wall hangings, keepsake books, pockets, needle books, etc. Each item I make is unique.